Today we’re proud to post a link to the thought-provoking conclusion of Todd Brown’s in-depth three part interview with Janet Morris. 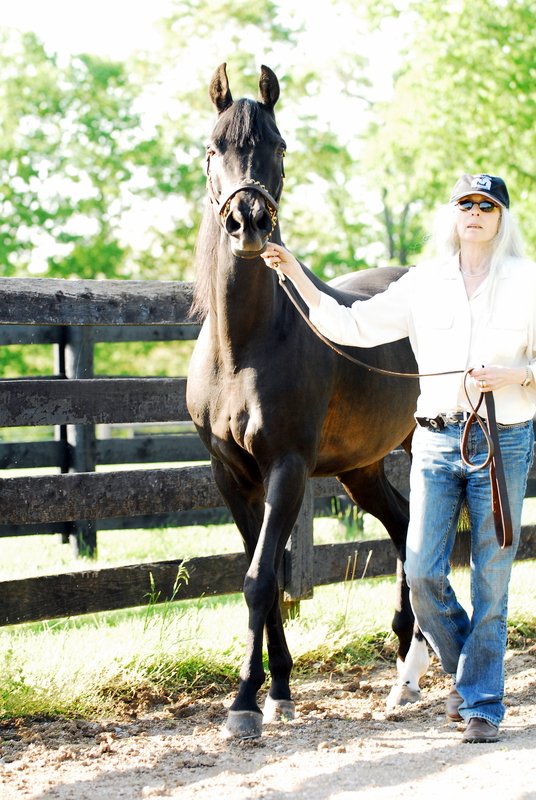 Janet Morris with UVM Christine, her Grand National and World Champion Morgan Mare. 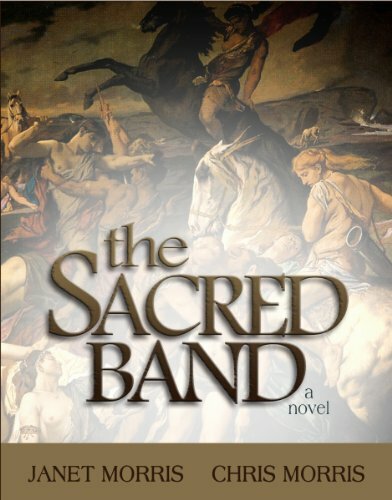 The Sacred Band novel is my favorite: Forty-six of the doomed Sacred Band of Thebes is rescued from the battlefield at Chaeronea in 338 BCE, by Tempus and his Stepsons. The gods and fates take umbrage or support, and a war (actually a theomachy) begins that follows Tempus and his fighters to Sanctuary. Do you need to be a history or mythology of fantasy buff to enjoy this? No, but knowledge deepens experience, always. All our favorite characters from the earlier series take a hand, and eventually the Unified Sacred Band fights the battle of their dreams. Since there really are forty-six skeletons missing from the mass grave at Chaeronea where the slaughtered Sacred Band of Thebes are buried, this story was a once-in-a-lifetime opportunity to blend history, fantasy, and mythology. We loved doing it. It’s been widely quoted on sites such as Ranker and has a big presence on Freebase and even a Wikipedia page. Negative reviews and rejections happen: reading is a subjective pass-time; different people bring different abilities, different levels of literacy, and different emotional states with them when they read. I sold the first draft of the first novel I ever wrote through the first agent that we approached, Perry Knowlton, and stayed with him until he died. I knew no one in publishing; my first book, High Couch of Silistra, cover several controversial topics, including eroticism and the genetic basis of sexual behavior. It found no friends among conservatives or feminists; the characters were pansexual but adhered to no earthly “group identity” that would please anyone. High Couch sold very well; I had done two sequels; they sold very well. In general the sf/fantasy people didn’t know what to make of this very intelligent sword-wielding courtesan. We got a pretty good New York Times Sunday Magazine review for High Couch, which meant that the sf/f people felt required to review it. A.J. Budrys reviewed it for F&SF and Omni within 30 days of one another: the Omni review was a qualified rave; the F&SF review said, “What a dirty book.” I asked Budrys how in good conscience he could write two diametrically opposed reviews of the same novel, and he said, “For money.” After that, I paid no attention to reviews for the next 20 years. Now, reviews are more important in that many are done by readers who are not getting paid and receive no instructions as to what to write. Nevertheless, all reviewers are not created equal. Write for yourself: soon enough, you’ll be dead and the reviewers also, but your work will remain, as you wrote it. I see that you did several Thieves’ World novels. When I discovered that I consulted my library and discovered the first Thieves’ World book by Robert Lynn Asprin & Lynn Abbey. Did you have much interaction with these writers? Bob Asprin asked me at a covention to write forThieves World (TW). The first volume had just been published. Lynn was not yet an editor. Bob asked for a gritty character suitable for a town that was the “armpit of fantasy.” I had already written “An End to Dreaming,” a short piece about two characters that later ended up in the TW series, but I wrote the first Tempus story, about an immortal warrior with a curse, for Bob: whomever Tempus loved was bound to spurn him, whoever loved him was fated to die. Bob loved the first story, “Vashanka’s Minion.” Writers were encouraged to use one another’s characters, so I used the god “Vashanka,” and several others, and thus interacted with Andy Offutt. Bob asked me to keep writing Tempus stories, and in close coordination with Bob and Andy, for TW #3 we did three connecting stories that included my “A Man and His God” (the life and death of the Slaughter Priest, Abarsis). Bob and I made a deal for that: I could kneecap his character if he could send mine to the vivisectionist (since Tempus always healed); Andy was drafted to get Tempus out of the vivisectionist’s clutches. So we became “canonical” TW writers, and seven novel and many stories followed. Much later I did the first TW spin-off novel, Beyond Sanctuary, part of a three-book hardcover deal, and TW took off about that time. Subsequently I wrote a three-writer TW novel with Lynn Abbey and CJ Cherry, “Soul of the City,” published as TW #8. We all had friends and enemies among the other writers; alliances shifted. Eventually I took Tempus and the Sacred Band Stepsons out of Sanctuary — twice, because of writer politics, and wrote my own Sacred Band of Stepsons series of novels. Then with Lynn’s permission my co-writer Chris Morris and I brought the Band back to Sanctuary, ten years after they left, in “The Sacred Band,” (Morris & Morris, Kerlak, 2011). Tempus and the Sacred Band of Stepsons, who began in 1980 and are still going strong today, are my favorite fantasy characters. With the sole exception of “I, the Sun,” a rigorous historical of the Hittite Empire, stories about Tempus and the Sacred Band are my favorite of my works alone and with Chris or with anyone. Lynn and CJ and I still keep in touch; Bob Asprin’s loss is deeply felt by many. You’ve been an established writer for a long time, in what ways have you seen the publishing industry change for the better and for the worse? The publishing industry, when I first started, had a strong mid-list, wherein a writer could incubate. While I was writing for a living, two things happened: the super book with huge advances destroyed publishers’ interest in mid list (the 35K to 65K book); Star Wars made sf/fantasy more successfully, but imposed a hunger for formulaic “B-Movie” type restrictions that took much of the fun out of sf/f, which previously had been more intellectually interesting. Fantasy has rebounded a bit from this formulaic hunger, but still the chance to experiment in sf/f was shrinking until the e-book, Publication on Demand, self-publishing and the new crop of small publishers arising as the big publishers fade away are a good sign. The novel in general has deconstructed about as much as it can: categories are marketing tools; a novel contains all elements, and should do. We like small publishing because the chance to experiment survives there. So we’ve started doing Heroes in Hell seriesand the Sacred Band series again, using small publishers so we can keep our e-book rights, and we like the freedom the small publishing world enjoys. I’ve seen that more and more established writers such as yourself seem to be more inclined to publish their own work rather than work with a publisher. What are your inclinations regarding self-publishing? Perhaps I covered this, but small publishers can and do provide better physical book production, better copy-editing, better covers, and more chances to experiment. Of course a small publisher can do a poor job, but really, is it a worse job than the big publishers do when they buy a book they don’t push? This is why we brought back The Sacred Band of Stepsons series and the Heroes in Hell series. With a small publisher, an established writer such as myself can have more control about many facets of how their book is presented. Writing to establish a corpus of work demands this. Most great books from earlier centuries were “self” published: the author controlled the process, and found a publisher to provide the book to the pubic. At small publishers like Kerlak, Paradise, or Perseid, I can ask for an get archival paper and real linen-covered baoards; I can get high quality metallic stamping; sewn bindings; I can control the cover, the cover copy; I can approve all phases of the work, not simply have a clasue in my contract that says “approval, not to be unreasonably withheld” that, when I try to exercise it, means that the publisher threatens to pull the book from its schedule if you want to make changes late in the process. Kerlak, especially, is great about last minute changes. They offered to reprint my entire Hell backlist and Sacred Band backlist but I’m going through each, making changes long overdue, so that each new release is an “Author’s Cut,” significantly revised by Chris and me, and — finally — just the way I want them. Do I miss the “big” promotion? “Publicity tours?” reviews from the big reviewing entities? Not really. My books will find their way; they always have. The three-book Silistra series had 4 million in print when “Carnelian Throne” was released; according to Jim Baen, when he reissued the four they gave Baen Books its first million dollar month. But that’s not why I write. I LOVE the e-book format, the big readable trade paperbacks, the quality hardcovers.With these publishers no one asks me to dumb down what I’m doing. No compromise is required in story or quality. Can everyone enjoy reading what I’m writing? Maybe. I write for my ideal reader; that reader gets a great ride. And now, thanks to the new publishing, a beautiful, literate presentation. 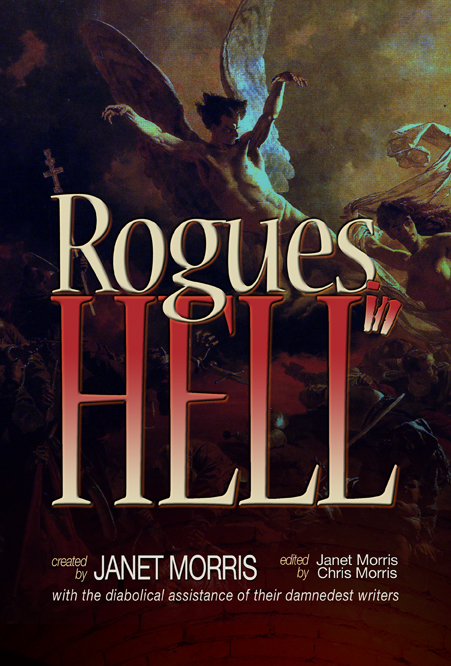 Can you discuss “Adventurers in Hell” and “The Sacred Band”?Adventurers in Hell (working title: may yet be changed to “Rogues”) is the second of the resurrected “Heroes in Hell series we’re doing. The shared universe of the damned as we did it in Heroes in Hell was very popular in the 20th century. Beginning with “Lawyers in Hell” (Perseid/Kerlak), edited by Janet Morris, we’re sinning once again. We have a great time with the Hell books: they combine myth, religion, history, and fantasy in a unique way. These stories take no prisoners: they can sly, cryptic, cynical, disturbing, or horrific. We have a waiting list of authors hoping to get in, despite the story curve, which is very steep. And, finally, we are getting great covers, beautiful hard covers, infinitely long-lived PODs and e-books. What fun.The Sacred Band is the ultimate (so far) tale of the Sacred Band of Stepsons, who began in Thieves World (R) and Sanctuary (R), a “shared universe” created by Bob Asprin, and return there in this epic novel. Tempus, Abarsis, Niko, and the rest are my greatest delight. The Sacred Band (Morris & Morris, Kerlak, 2011) novel is best accompanied by the recently reissued Author’s Cut” of the anthology “Tempus.” If you read those two, in any order, then you’ll enjoy each one more. We’re working now on reissuing the six additional Sacred Band novels and a second anthology with new stories and the remaining TW stores.But The Sacred Band novel is my favorite: Forty-six of the doomed Sacred Band of Thebes is rescued from the battlefield at Chaeronea in 338 BCE, by Tempus and his Stepsons. The gods and fates take umbrage or support, and a war (actually a theomachy) begins that follows Tempus and his fighters to Sanctuary. Do you need to be a history or mythology of fantasy buff to enjoy this? No, but knowledge deepens experience, always. All our favorite characters from the earlier series take a hand, and eventually the Unified Sacred Band fights the battle of their dreams. Since there really are forty-six skeletons missing from the mass grave at Chaeronea where the slaughtered Sacred Band of Thebes are buried, this story was a once-in-a-lifetime opportunity to blend history, fantasy, and mythology. We loved doing it. It’s been widely quoted on sites such as Ranker and has a big presence on Freebase and even a Wikipedia page. And I think, having had the ride of my life with TSB, we’ll do another Sacred Band novel soon…. I see that you’re a horse person. I grew up with Morgans as well, they’re beautiful animals with a good temperament. Most people probably don’t realize how much of a personality horses have. What do you see as the greatest benefit to caring for horses? The Sacred Band is an ancient cavalry force. No surprise, since we raise war horses — the descendants of the US cavalry horse — horse and have been riding our whole lives. Horses bring you nose to nose with nature. You can’t lie to a horse. Crying does no good. And the gods look out at you through the eyes of a horse. No more transcendental experience can be had than what you experience with a horse. We’ve won a few races, a few Morgan World Championships. We had some reining horses of renown, some in-hand horses. But you don’t do horses for prizes, or for anything but your soul’s sake. Do horses inform my writing? Absolutely. Do they ennoble my life? Always. We breed to sell, and that’s hard: letting the baby you’ve foaled out go into someone else’s hands. But even an old gelding rescued and living in a back yard paddock is precious. Without horses, all the frailties of humankind at times seem overwhelming — until you find a horse. If the horse loves us, wants to be with us, companion in all weather, fair and foul, then how bad can we be, as a species? 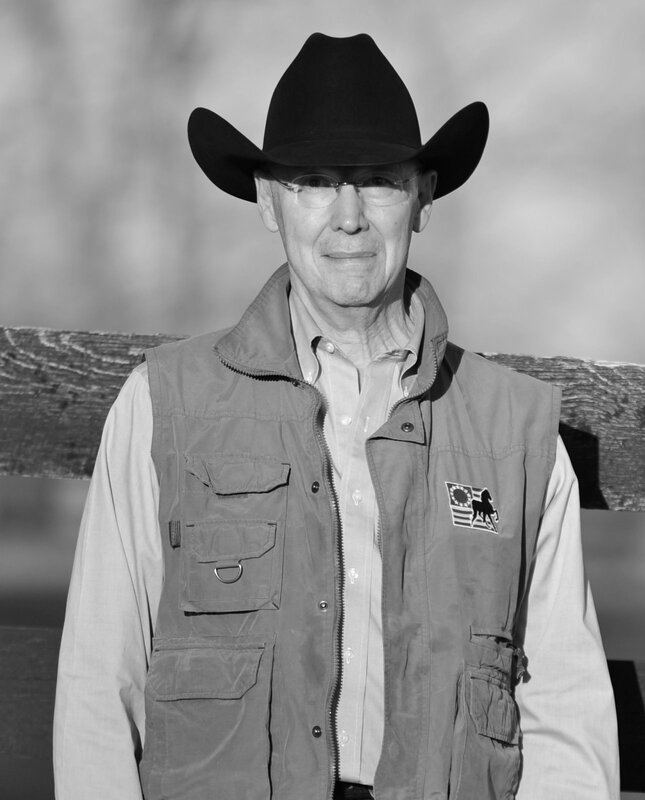 We’re deeply involved in the campaign to end horse slaughter, and we hope the day will come when horses, who helped us build civilization, are honored and respected for all they’ve done for us.